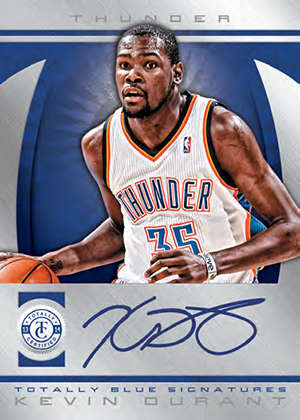 2013-14 Panini Totally Certified Basketball has all the hallmarks of the brand, most notably the trademark etched foil design. It's also got an infusion of some new inserts that take on an acetate flavor. The hit-per-pack product includes three autographs and three memorabilia cards in every box. 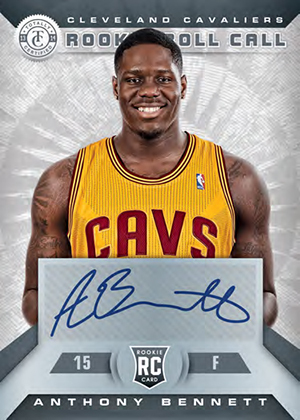 The base, autograph and memorabilia card checklists in 2013-14 Panini Totally Certified Basketball are big. The base set has 300 cards. Given that there are so few in every box, it'll be a challenge to put together. Multiple levels of colorful parallels return, including the popular Totally Green cards that are numbered to 5. Totally Signatures is the main autograph portion of the set. A total of 260 players signed for the set. Besides Silver versions, there are Red, Blue, Gold, Green and Black parallels. 2013 draft picks are the focus of autographed Rookie Roll Call cards. Forty rookies signed for the set. Sticking with the theme of large checklists and lots of parallels are the set's memorabilia cards. In all, 200 players are showcased. Aside from the basic memorabilia cards, there are five Prime parallels: Blue, Red, Gold, Green and Black. These have patch swatches and other colorful premium jersey pieces. The biggest change in 2013-14 Panini Totally Certified Basketball is the addition of four acetate insert sets: Ballot Busters, Future Stars, Present Potential and Select Few. All four have autographed versions as well. 2013-14 Totally Certified Green #109 Moses Malone PATCH Hawks 2 5 Jersey #! Good: Distinct from other sets, colorful, nice texture. Bad: Not much variety outside of colors, bloated checklist, damaged cards. The Bottom Line: 2013-14 Panini Totally Certified has a lot of flash. Yet, it seems toned down from previous years. It’s the type of product that relies of parallel rarities rather than several distinct working parts. For those who like low serial numbers, it has potential. For those who like to dig a little deeper, there’s not a lot there. I’m a big believer that every product should have something that makes it stand out. For Totally Certified, it’s the etched foil. The look might not be for everyone, but it does bring some nice texture that elevates it above traditional foil (something I’m normally tired of now). That said, the swooping borders that run up the sides of the cards are too dominant and take away a lot of the textured look. The horizontal layout of the memorabilia cards works for blocking, however, the parallel names that repeat several times behind the player image are very distracting. My favorite cards in the set are the autographs. While they use stickers on foil stock, something that rarely works, the swirled foil best exemplifies the bold designs the brand is known for. 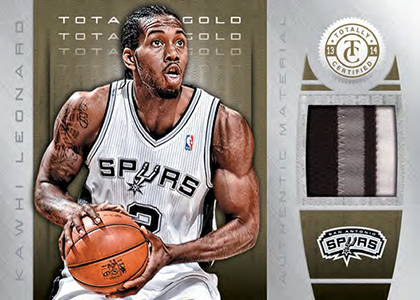 Much of the 2013-14 Panini Totally Certified Basketball checklist relies on parallels. It may be cost effective, but it doesn’t make for the most compelling experience. The product has a large checklist. It’s nice that rookies aren’t short prints in the base set, but the configuration makes it very tough to pull any particular player. Cutting out some of the more marginal retired players, especially those found in lots of other products, would give the set that much more punch. 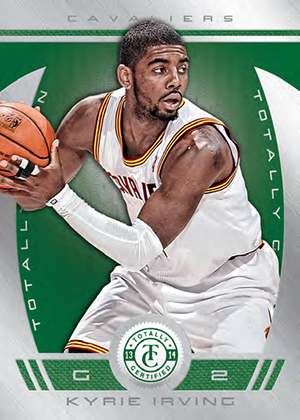 Much of the value in 2013-14 Panini Totally Certified comes from the low-numbered cards. With so many levels of parallels, virtually every box is bound to have one or two. The problem is, that when you factor in the huge number of parallels in the set and the fact that lots of other products follow a similar pattern, the chances of landing something great are tough. I do appreciate that Totally Certified finds a way to stand out. The textures and colors can be interesting, but the sheer number of parallels gets boring. The box I busted also had several misprinted cards where the names and etched foil were left off. These things happen, but when there aren’t many cards in the box to begin with, it’s disappointing to have to go through the steps to replace them. Hopefully this is an isolated situation. Still a beautiful set but I am very upset to see that in both football, and basketball there are no HRX Video cards. Bummer, those things are soooo sick. i love this product because even if you dont get a monster, which is asking for a lot out of a low price box anyway, seems you’ll always get one, two or more solid hits or numbered cards. And the cards are beautiful. I’m already thinking about 2014-15 Certified. Keep the price point and the 3 auto and 3 memo configuration. 6 packs is the staple. Bought some boxes recently. Hit some nice swatches, signature cards from relevant players old and young…and a couple of those dope totally greens.